The vintage brick residence in downtown Mansfield is officially known as 159 North Walnut Street. Many locals, however, know it as the house at “The Corner of Fifth and Walnut,” the name of author M. Eileen Levinson’s autobiographical work profiling her childhood there in the 1920s and 1930s. 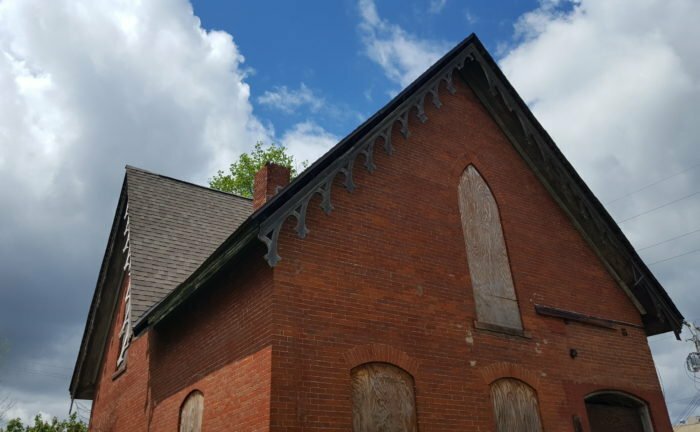 With the recent announcement of a new preservation-minded owner, and the consideration of landmark status by Mansfield City Council, the structure is poised to be given a new lease on life. Work continues on unraveling facts about the house’s early years. Amazingly, it appears likely that its first two owners may have been both been involved in the California Gold Rush. 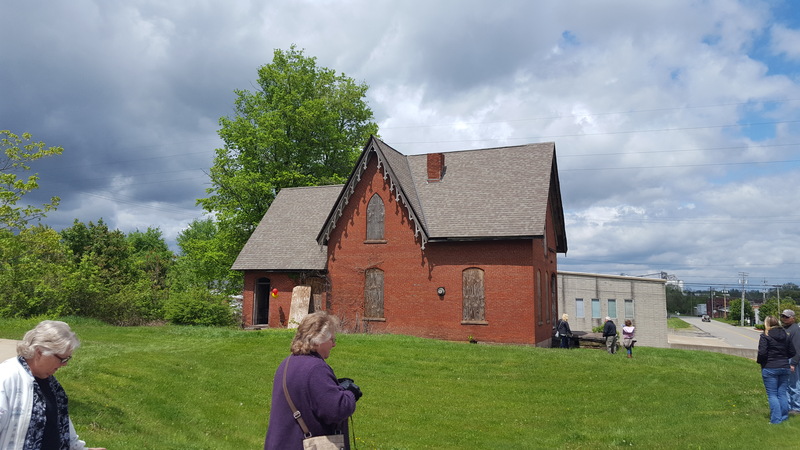 While its Ohio Historic Inventory form lists a date of construction as 1868 by an A.G. Hedrick, an article written by Levinson called “The Remarkable Mr. Dickey” shares that the house was actually built in 1860 by Moses R. Dickey and sold to the Hedrick family in 1869. The article, published in the July/September 2009 edition of The Pathfinder, the newsletter of the Richland County Chapter of the Ohio Genealogical Society, profiles the life of Moses Dickey – including his service in the Mexican War, travel to California in the Gold Rush of the 1840s, attendance at “Haysville University” (possibly the Hayesville Academy), service as a Lieutenant Colonel during the Civil War, and Judge of the Richland Court of Common Pleas. It also shares many other details of his life, and can be found at this location online. A.G. Hedrick himself was an important early Mansfield figure. He arrived with his parents in 1826 at the age of 12. Like Dickey, in 1849 he traveled to California to seek his fortune in gold, but that dream was short-lived; after a brief stint in Idaho, he returned to Mansfield for the remainder of his life. In 1882, he built a new house on Bartley Avenue. He died in 1891 in a very tragic way. In the 1850s and 1860s, A.G. Hedrick & Co’s business at no. 2 in the Commercial Block on Main Street sold crockery, glassware, wooden ware, cabinet ware, wallpaper and furniture. The house at Fifth and Walnut evidences several details which reflect the Gothic Revival style prevalent in mid-19th century America. Such structures, like this house, typically featured steeply pitched roofs, decorated vergeboards (also known as bargeboards, the ornamented elements extending from the eaves), and Gothic-style windows. Locally, the most known surviving house in this style is Oak Hill Cottage, and a comparison of the two would show many similarities. The 1887 and 1892 Sanborn Maps of the City of Mansfield show the house without its current front porch; the porch first appears in the 1897 edition. Above all, the house at Fifth and Walnut is a survivor. 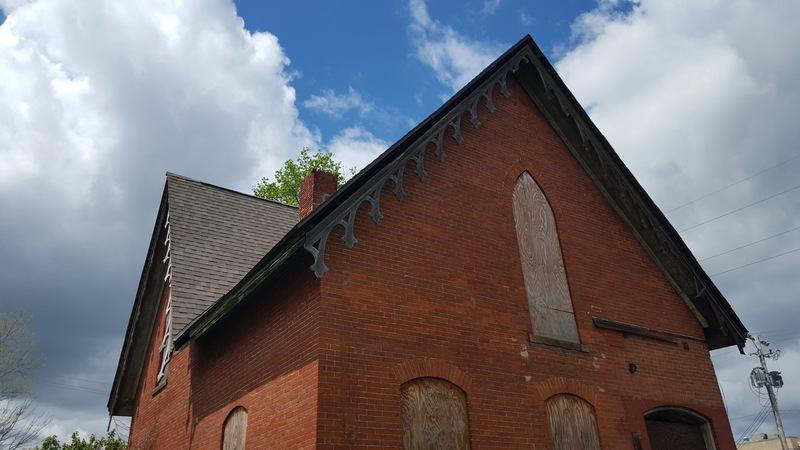 Since its construction, it has lost much of its surrounding neighborhood on two occasions, and yet it has managed to hold on despite some five decades of vacancy. 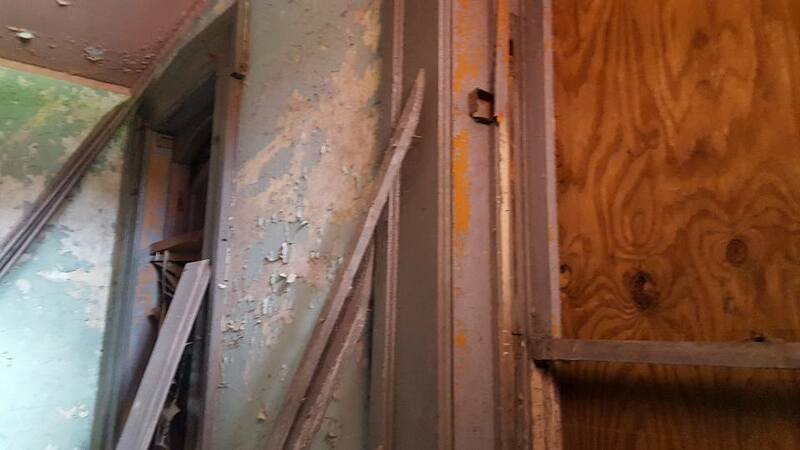 The interior is rough but with salvageable character; when Downtown Mansfield Inc.’s Secret City Tour was taking place earlier this year, many visitors to the house could be heard remarking on its potential. As seen in one of the photos below, the interior retains original window and doorway framing indicative of the period (click any image for a larger version). Now, with new owner Steven McQuillin, who has a strong track record of success in bringing such properties back to life, that potential is on tap to be realized. We wish him nothing but success.